The SAE Standard has been prepared to provide a universal three dimensional manikin for use in defining vehicle seating accommodation. This represents the weight and contour of a 10th, 50th & 95th percentile adult male. Constructed of reinforced plastic and metal, it consists of a separate back pan and seat pan, mechanically hinged at the hip or "H." point, which simulates the actual pivot centre of the human torso and thigh. 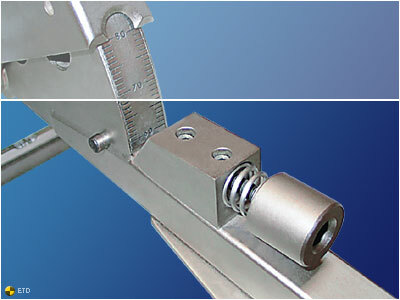 A graduated sliding probe is hinged from the "H" point to measure the effective headroom in the compartment. A quadrant is fastened to the probe to measure the back angle. 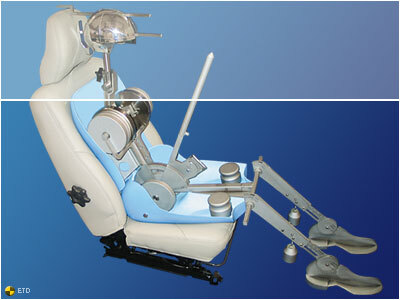 A thigh bar attached to the seat pan establishes the thigh length and serves as a base line for the hip angle quadrant. Lower leg segments also adjustable in length are connected to the seat pan assembly at the knee joint T bar, which is a lateral extension of the adjustable thigh bar. Quadrants are incorporated in the lower leg segments to measure the knee angles. Pivoted at the lower end of the lower leg segments, shoe and foot assemblies are calibrated to measure the angular relation. Positive stops are provided in the thigh and lower leg segments for the tenth, fiftieth and ninety fifth adult male percentiles. Two spirit levels orientate the device in space. Body segment weights are placed at the proper centre of gravity locations to bring the mannequin's weight to 76 Kg, the fiftieth percentile adult male weight. This mechanical force gauge is directly mounted onto the manikin. This unit displays all relevant measurements in accordance to EU standard requirements. This digitale force gauge could be used for simple industrial measuring as well as for accurate quality control measurement needs. 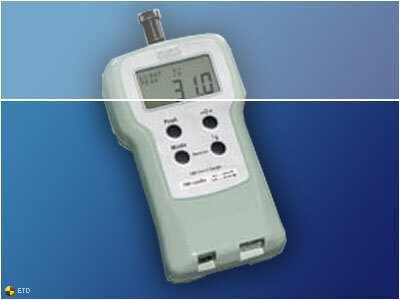 This digitale indicator delivers all relevant information in accordance to EU standard requirements. This robust measuring instrument works bidirectionally to record both force and weight measurement and has a high definition (0,01 N) incl. built-in overload protection. All test data collected is displayed on a large high resolution reversible display with selectable engineering units either for force (SI-unit Newton) or weight measurement. Because of the fast data collection (1000 Hz), the force peaks can be precisely recorded e. g. closing/opening forces or tearing tests can be exactly reproduced. As required during the measuring procedure either the actual measurement data or peaks can be displayed. The latter are automatically internally stored and can be recalled and displayed at a later date when required.